There's something about card making that I always find really difficult, so it was with some surprise that I made a little card that I actually like. I think I'm starting to get into my card making groove - a little like scrapbooking it's all about becoming happy with your own style. Today I'm sharing a little card for my sister who's a bit fed up with being ill and off work. A 'Get Well Soon' card didn't seem appropriate but, luckily, the Sophie's Sentiments set from Lawn Fawn has something that will work for almost any card. I've used the 'Thinking Of You' sentiment, along with one of the stamps from the Naturally You set - which is just peeking out behind the embellishments. This set is only available in stores, so head on over to Make The Day Special and snap yours up. You'll be the envy of all your friends! This is a gorgeous card! You rocked it! Love it! The lady bug theme is uplifting and I also love your useof stamps. 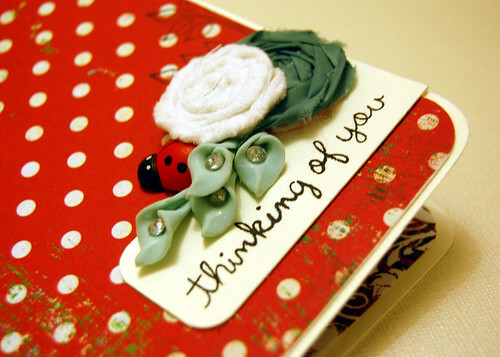 It's a lovely card :) I bet that ladybird will give her a smile.. The card is gorgeous!!!! I understand what you mean about "actually liking it". I've just been having a catch up on your blog - it fell off my "blog-dar" for a while...blooming blogger. Back now though. Love the card and the journal you have put together for your India trip. You must be so excited! Congrats! What a pretty card - I love the beautiful flowers you used. That would cheer anybody up! Beautiful card...love the bright, cheery colours! Love the ladybug with the flowers, a nice change from just flowers! Love the cluster of embellies! I am not good at card either...send me some of your new found card mojo!! Lovely card, I'm sure your sister will appreciate it and hopefully it will brighten her day. 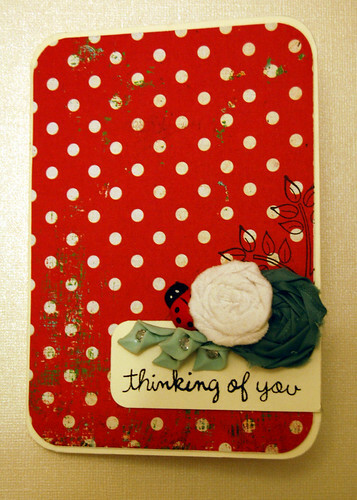 such a gorgeous card - the paper you have used is gorgeous. It packs such a punch. What a delight to get this card through the post. This is gorgeous! I love the colours! This card is just adorable. I love little embellishnment clusters! I agree that it's all about getting comfortable and happy with your own style and you did an awesome job with displaying yours. I love the rolled flowers.